The house is situated in a small wooded village called Ljubinj near Tolmin. You can walk straight out of the door and be in the woods in less than 100m. In fact, Ljubinj is right on the edge of the Triglav National Park and the Julian Alps. I would be perfect for both a quiet, relaxing holiday or one full of outdoor activities. There are countless walks, paths and waterfalls without having to get in the car. It is within walking distance of one of the best rock-climbing cliffs in the area and has views of the paragliding take-off from the window. In fact the village is on the way to Kobala paragliding take-off! It is the perfect base for walking, climbing, cycling and paragliding whilst at the same time being just minutes from Tolmin and its supermarkets. Lake Bled and Bohinj are on the other side of the big mountains behind the house. Luckily there is a car train from Most Na Soci (5 minutes from the house) that can take you to Bohinj in around half an hour (with your car)! Bled is about another 15 minutes from there. The house has been totally renovated whilst retaining its original charm. The first room you enter is the kitchen. It is interesting because half of the ceiling has been cut away creating a double height void with glass panels in the roof giving lots of light. After the kitchen, we have restored all of the original wooden floors. The hallway leads into the lounge which has views of the mountain in front and a traditional stove. Leading off from the lounge is the sleekly designed bathroom with an large walk in shower and stone floor. There are quite steep stairs (not for elderly or very small children) leading to the 1st floor landing, Again here part of the ceiling has been removed to give a double height and plenty of light through the glass panels. There are 2 tasteful double bedrooms on this floor. Up some more steep stairs and we have the top landing with an area for quiet reading and admiring the mountain views. Leading off this is a very large attic room that has 2 futon beds, one single and one double. The bathroom has been stylishly redesigned and features a large walk-in shower and stone floor. This is a very tastefully restored traditional village house. The house retains all of its rustic charm, but that does mean that it would not be suitable for people with reduced mobility or very young children. Specifically, the stairs are original and quite steep. Tarash Cottage is a hidden gem! We spent a week in the Soca Valley and stayed at Tarash Cottage. It was a week we will never forget. The cottage is charming and comfortable. The small village of Ljubinj is picture perfect and we could walk out the front door of the cottage and take a different hike everyday. Tamara and Miha, who manage the property became friends and were so helpful in suggesting what we might do while we were exploring. I am a tall man and I had to duck through every doorway but this only added to the charm of the cottage. It has been so lovingly restored by Demian who was also available by WhatsApp whenever we needed him. We plan to return to Tarash Cottage in the future and would recommend it to anyone who is looking for a lovely, old accommodation that has been updated with all the modern comforts you would want. What a gorgeous base for our stay in Slovenia. Well located for walks into the hills and by the Soca, and the car train from Most na Soci to Bohinj. The house itself has loads of character and was toasty warm with the woodburner going. We also loved the peace and quiet in Ljubinj and watching the mist pass by the surrounding hills in the morning. In unserem Aufenthalt haben uns die idyllische Lage des wirklich liebevoll eingerichteten Häuschens überzeugt. Durch den netten und stets hilfsbereiten Kontakt zu dem Vermieter konnten kleinere Fragen direkt beantwortet werden. An die von Maite empfohlenen sehenswerte Ziele erinnern wir uns noch gerne. Das Haus wurde von den Vermietern sehr schön renoviert und mit Liebe zum Detail eingerichtet. Die Lage ist sehr ländlich und ruhig, einige sehr schöne Ausflugsziele sind von dem Haus aus in kurzer Zeit zu erreichen. Einkaufsmöglichkeiten gibt es in dem nahegelegenen Tolmin. Wir haben uns sehr wohl gefühlt und würden das Haus jeder Zeit wieder buchen. Damian and Maite‘s cottage is a great place to spend your vaccation, a unique house, lot‘s of space and all you need to spend a good time. The location is fantastic. A 15 minute drive from Tolmin, Ljubini is a beautiful village right at the entrance to the Triglav mountains. The Socca valley is great for all activities you would like to do in the Alps: hiking, cycling, swimming, paragliding.... Damian‘s recommendations for what to do were extemely detailed and helpful. We (family of 4, 2 boys aged 7 & 10) spend a great week there. Zwemmen in de Soca en een bezoek aan Slap sopot moet je gedaan hebben. Tip, ga zwemmen in de Soca bij Camp Gabrje (onderaan rechts 50m), maar ga eerst waterschoenen kopen. Huisje was prima in orde. 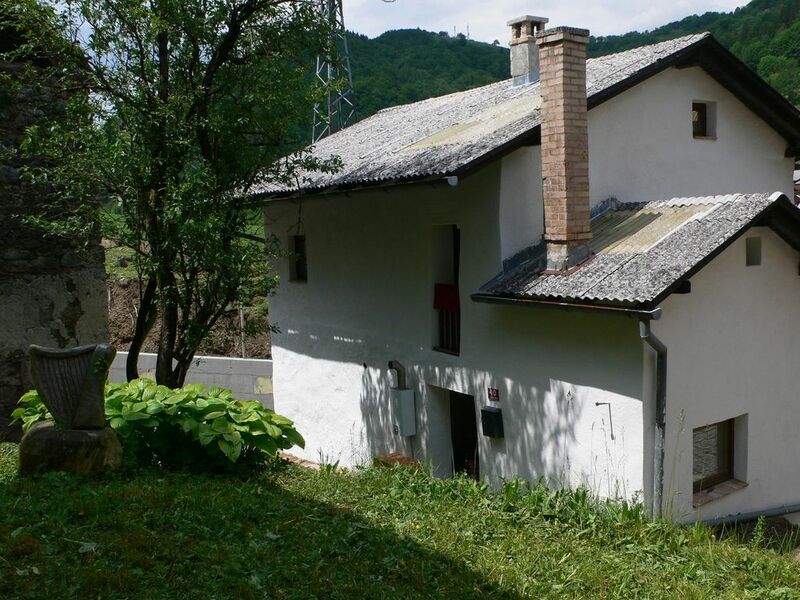 The house is situated in a small wooded village called Ljubinj near Tolmin. You can walk straight out of the door and be in the woods in less than 100m. In fact, Ljubinj is right on the edge of the Triglav National Park and the Julian Alps. I would be perfect for both a quiet, relaxing holiday or one full of outdoor activities. There are countless walks, paths and waterfalls without having to get in the car. It is within walking distance of one of the best rock-climbing cliffs in the area and has views of the paragliding take-off from the window. In fact the village is on the way to Kobala paragliding take-off! It is the perfect base for walking, climbing, cycling and paragliding whilst at the same time being just minutes from Tolmin and its supermarkets. The Soca river is 4 km away.